I have long been intrigued with color. Some geniuses can look at the piano and 'get it' or do math in their sleep. To some, a canvas speaks to them or the sculpture is in the marble waiting to be carved free. Others are born to sing or work with their hands, have a sense of people's needs or can readily wrap their mind around litigation. Numbers dance in patterns to certain financial wizards and chefs pair flavors like notes on a piano. We all have gifts in this and that---things that make sense or come quite naturally. For me, 'color' falls in that category. I can imagine varying colors on walls---and picture its effect. I love painting walls, especially selecting coordinated paints for an entire house. If I am in a store picking out socks, I can remember if it will match a sweater tucked in the back of my closet. When I was a little girl I would save up my money to buy colored markers---and use them until they wore out. I have always loved to play with colors (disclaimer: I didn't say it gave me a fashion sense or license for interior design... simply that I have a sense of color)---and this extends itself to food. Yes it is fun to 'paint' with food on the plate---like adding a colorful garnish to elevate a dish. But for some reason, my current intrigue with color plus food is the challenge of a single color being pulled through an entire meal. I once wrote about an all-black menu, love the idea of all-red for Valentine's day and for this middle-of-the-winter challenge I couldn't help but nab colorless white. The beauty of an all white, honor-the-snow meal is that color is set aside and what you are left with is the taste. It is fun to walk through a market and eyeball all the white food, mentally dismissing globes of eggplant and the glowing orange flesh of sweet potatoes. Leafy greens will have to wait. Only half a leek can earn its way onto my menu. Russet potatoes can come, white onions and chicken or a myriad of white fish. Parsnips, fennel and the flesh of a pear. Now the ideas are churning. It was so fun to come up with an all-white meal... though it was hard to turn the ideas off. I could have made white chili and white sangria, pear fennel soup or a myriad of homemade ice creams (coconut, macadamia, white chocolate...). It was hard to resist a white vegetable gratin and I could have easily incorporated a cheese board. There are plenty of white beans, white rice and I it would take no arm-twisting to serve crab or scallops---maybe in handmade ravioli? Even gnocchi almost made the cut. Perhaps I will have to host another wintery white meal soon?! Or maybe go hog-wild and pick another color to play with. What color would you choose? Celery Root Salad serves 4-6. Mix dressing: lemon, honey, Dijon, oil, salt and sour cream. Cut celery root, apple and scallions and add to dressing in bowl. Blend. To serve I formed my salad in a rectangle, drizzled olive oil in a circle on the plate, then topped it with shaved sun-chokes (white on white). Combine chicken and all ingredients---except sugar and wine---in Ziploc and marinate overnight. Oven to 350, fill baking dish with a single layer of the chicken and spoon on some of the marinade---including all figs. Sprinkle withe the wine and sugar and bake 45 minutes to an hour. Serve over garlic mashed potatoes and spoon pan juices on top. Parsnip & Apple Soup serves 4.
cook leeks and shallots in olive oil over low---about 5-7 minutes---until translucent. Toss in apples and parsnip, season with salt and pepper---and celery salt if using. Stir and let cook a few minutes, then add apple juice (no apple juice? Use cider or apple brandy) and let cook another 3-5 minutes. Add broth and simmer 10-12 minutes until apples/parsnips are tender. Puree, then add cream and simmer until heated through. 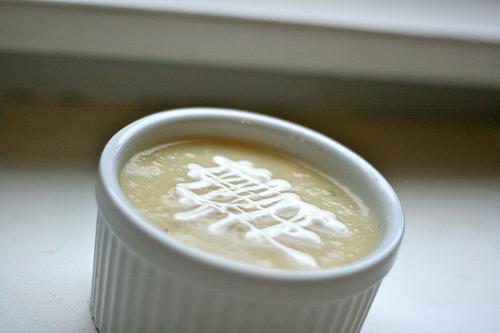 Combine creme fraiche (or sour cream) and buttermilk in squirt bottle and drizzle on soup to serve. Note: my guests for this meal were our neighbors---Eric, Heather and Mia (7 year old daughter). Eric made us lovely gin martinis; Heather is holding soup in B&W photo. Mia brought a special matching doll. My husband James and son Anthony are pictured in the top black and white photos. Caleb (son) and myself didn't make it into the pics this time;). *Foodbuzz 24x24 is a monthly challenge where 24 bloggers cook 24 meals and post them over 24 hours. As a Foodbuzz featured publisher, I am invited to submit ideas for approval and receive a small stipend. It is a fun exercise when selected. You can read my previous 24x24 meals here: 1. an all-jar feast, 2. returning to America (after a year abroad) and 3. my experience cooking in a farmhouse in Southern Tuscany. Aug 29 foodbuzz 24x24: an all-jar feast.